Visit USA Domains for complete details. USA Domains Review: When it comes to shared web hosting the choices of who you use are virtually endless. Thus a lot of companies are there one night and gone the next morning, only after they take your money. Well, Best Free Web Space has found a shared web host that isn�t like that. USA Domains has been around since 1998 and is not going anywhere other than to the top! 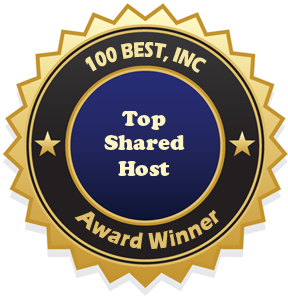 It is because of their reliability, services, and prices that we are proud to award them our Top Shared Host award. Keep reading this USA Domains review for more info on them. As we said in the opening paragraph, USA Domains has been around since 1998. During that time they have been able to expand their services for their clients and offer almost all the tools they need to run a successful website. Those services not only include shared web hosting but also reseller hosting, cloud hosting, dedicated servers, domain name registration, SSL certificates, and much more. While Best Free Web Space thinks that all of the USA Domain products are great, we are only going to concentrate on their shared web hosting plans in this USA Domains review. When you visit USA Domains and start to look at their shared web hosting services, you are going to notice that they offer you three plans to choose from. What you need to pay attention to is that all three of them offer you unlimited disk space and unlimited data transfer. While a lot of hosts offer you multiple plans, it is usually only their premium plans that offer those unlimited features. USA Domains has been recognized by other web hosting review sites for their unlimited services. Of the three shared hosting plans, two are geared towards personal use and one towards business web sites. The two personal plans only differ in the number of domains you can host on your account. In the basic plan you get one hosted domain and the advanced plan you get unlimited. The business plan is identical to the advanced plan with the addition of a free dedicated IP and free SSL certificate. Both of which are a necessity for any eCommerce website. Something that seems to go unnoticed when people look at the shared web hosting providers is the equipment they use and the software they offer you. With USA Domains they only use the best servers and then they limit the number of customers on each server. This keeps the servers running the best they can! When it comes to software USA Domains not only provides you the cPanel control panel but also Softaculuos. Softaculuous has over 260 web hosting script programs installed on it for you to use! This includes many of the popular programs such as WordPress, shopping cart software, CMS, and much more. The price of the basic plan is only $3.96 a month, the advance plan is only $6.36 a month, and the business plan is only $10.36 a month. All three of them are a great deal when you look at the features and quality of product you get with USA Domains. This is a promotional rate so be sure to check the current offerings for the latest pricing. The next time you are looking for some of the best affordable web hosting, check out USA Domains!